There’s just something about going outside and cooking on the grill, don’t you think? This is something that people around the world enjoy doing. Did you know there’s now another way to grill, other than using an actual grill? Now, you can find at home griddle cooking surfaces. Many restaurants are using commercial griddles because they’re big, they add even more flavor to the food and they get the job done quickly. An outdoor griddle sounds like a good idea, but unless you’re familiar with the griddles on today’s market, if you’re not careful, you could end up picking the wrong one. Personally, for a variety of reasons that I will be discussing, Blackstone products are a great choice. 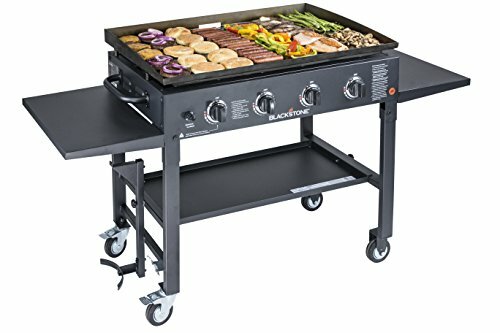 In this particular case, I’m going to be discussing the Blackstone 36-inch outdoor flat top gas grill griddle station. Grilling with the Blackstone Griddle is fun and you won’t feel any bit of frustration. In no time at all, the griddle will heat up evenly. Have you ever cooked with a cast iron frying pan? If so, then you can understand the special pre-seasoned flavor …that is exactly what this griddle does. With the Blackstone Griddle, you have a variety of options to choose from and I don’t know about you, but I like it when I have options. Starting out, you get to choose the size of burners you would like. You can choose 2 – 28-inch burners, 4-36 inch burners, or 4-36 inch burners with a side shelf. I personally like having 4-36 inch burners with a side shelf, but I have friends that wouldn’t mind having 2-28 inch burners on their griddle. You also have different styles to choose from. You can just buy the grill, or you can buy the grill with a cover. They also offer the pro bundle and the starter bundle. I always like it when a product includes fun accessories to play around with. You have a five-piece accessory kit, a cutting board, the breakfast kit, and a 36” grill cover (as long as you choose the grill+cover option). Take note that the accessories for the 36-inch are the same for the 28-inch. Cook Big or Cook Small – if you choose the 4 burner option, then you’re going to be able to cook a whole lot of food at one time. The four solid stainless steel burners make it so that you can cook on 4 different cooking zones. Secure Footing – Once you assemble this griddle (that is easy to do), securing it isn’t going to be an issue. There’s a total of four industrial-strength caster wheels on it, so you can easily move it around wherever you need. Once you have the griddle in the spot you would like it to stay, simply lock the wheels and it isn’t going to move. Quick Start – When you’re ready to start the griddle, all you have to do is push the igniter button and it is going to start up quickly. Rear Grease Management System – There’s a nice built-in grease channel that is responsible for taking the grease away from your delicious food. This not only eliminates greasy food, but it also makes clean up easy. The 28-inch version is decent and is a good choice if you’re looking to save money as it is cheaper. The width of the 28-inch version is 18-inches shorter, which can be a good thing, especially if you’re looking to save some space. The 28-inch version also weighs 45 pounds less than the 36-inch griddle, which comes in handy if you plan on traveling with it. I also noticed that the performance of this version is slightly better than the bigger version due to the configuration of the burners. You see, the 28-inch version has two burners that have been split into an “H” type of configuration, while the 36-inch version has four linear burners. This means that while the 28 has four burners to heat 470 square inches, the 36 has four burners that will need to heat 720 square inches. When you have the same amount of burners spread over a smaller surface, you’re obviously going to have better performance. The 36-inch griddle option is my favorite for a couple of reasons. One of those reasons would be the capacity – if you look at the cooking area, the 36-inch griddle option is 53% larger than the 28-inch griddle option. Can you imagine what you could get done with all of that extra space? Another reason is due to the flexibility. Even if you only plan on cooking for a couple of people, the space will increase how you cook. Plus, it is always nice to have two burners for cooking and an addition two burners for keeping things warm. Adjustable Heat-Zones – You have a total of 4 adjustable heat zones. This will allow you to cook different types of food at one time, without having to worry about burning it. You will also have the option to keep the food warm while the other food cooks. Easy to Put Together – I know some that dread on buying a grill because they have to put it together. This product isn’t all that hard to put together – I can see it taking a little under one hour to assemble. The only tool you’re going to need is a Phillips Screwdriver. If you’re not able to lift fifty pounds, I recommend getting someone to help you. Pre-seasoned – If you have ever cooked with a cast iron frying pan before, then when you hear the word “pre-seasoned,” you know exactly what I’m talking about. A pre-seasoned cooking surface delivers a special type of flavor to the food you cook in it, and as an additional bonus, it’s non-stick. Basically, pre-seasoning is an accumulation of grease/fat over time. In order to pre-season this griddle, I recommend using some shortening during the first grill cycle, but the pre-season coating is going to build up on its own in due time. Cook Juicy Burgers – Some are under the impression that the traditional grill is the one that makes the best burgers, but that’s only because they have never tried this Blackstone griddle. Once you use the Blackstone griddle to cook burgers, you’ll know exactly what I’m talking about. Durable – When it comes to griddles, grills, and other appliances, I can’t stand seeing plastic stuff on them. I understand, companies do this in order to make the item more affordable, but personally, that’s just too cheap. This griddle right here doesn’t disappoint me with plastic pieces – I enjoy everything from the steel cooking surface to the steel grates. With this griddle, I recommend purchasing the grill cover with it, because as durable and heavy-duty as it may be, it can still rust over time. Cleanup is Fast – Cleaning this griddle up isn’t a hard task at all. In order to clean the griddle, all you have to do is take some water, grab a scraping tool and a nice grill sponge. After you have finished cooking, and the griddle has cooled down a bit, take the spray bottle and use it to wet the griddle. Use the grill sponge to wipe the griddle down and if anything is sticking to the surface, you can use the scraping tool. Once it looks clean, use some oil as a protective layer. Don’t forget to empty the drip bucket and the drip pan. Grease – Okay, yes, clean-up is fast, but the grease is a hassle. When it comes to the grease management system, there are some flaws. Starting out, the grease doesn’t drain off from the grill like it would if we lived in a perfect world and everything worked like it should. However, there is a solution to this! Take a bucket that is lined with some aluminum foil and set it under the grill wherever that extra grease is dripping off. It is important to season your griddle once you get it. Check out the video below to find out how to do this. If you are looking to compare the two different sized Blackstone grills, in actual quality there is no difference. Obviously, the bigger griddle will mean that you can cater for more people or cook more food at one time. The only other feature that is different is that the 28-inch version has 30,000 BTU and the 36-inch 60,000 BTU. 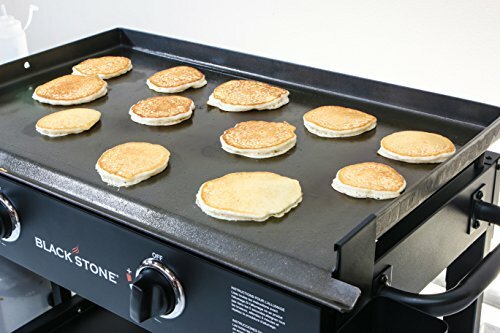 Point blank, if you’re currently looking for a good griddle that will help you cook the same food you find in a fancy restaurant, then Blackstone has a good griddle for you. I have always been a big fan of Blackstone and have always liked the idea of having a griddle over a grill. In the past, buying an outdoor griddle like you would find in a restaurant was expensive, but thankfully, Blackstone has made it affordable. You can cook everything from eggs and hamburgers to steak and rice on this griddle and being able to cook it all on a large grilling space is even better.